Bulletin of the John Rylands Library Manchester Vol 16 No. 1, January 1932. Manchester: The University Press,	1932. Tall 8vo., orig. printed wrappers, 319pp. Wrappers chipped and worn, a good copy. Catalogue of the Manuscript Maps, Charts, and Plans, and of the Topographical Drawings in the British Museum. (London: Published by the Trustees of the British Museum,	1962). In three volumes. 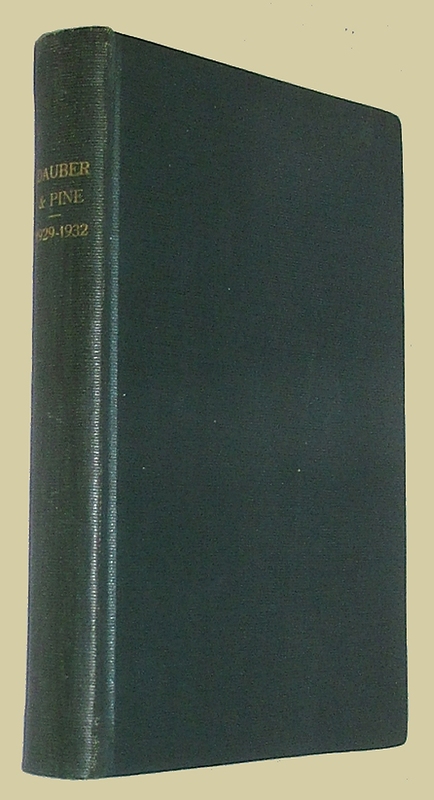 Facsimile reprint of the edition of 1844-1861. Tall 8vo., orig. cloth. Small rubberstamp on front e/paper, the odd annotation in ink, o/w fine copies in d/w which are slightly faded on the spine but o/w fine. Famous Books Sketches in the Highways and Byeways of English Literature. Spine quite faded o/w a good copy. ALLEN, W.O.B. and Edmund McClure. Two Hundred Years. The History of The Society for Promoting Christian Knowledge 1698-1898. New York: Burt Franklin,	(1970). Reprint of the 1898 edition. Cloth. FIne without d/w as issued. AMBROSINI, Maria Luisa and WILLIS, Mary. The Secret Archives of the Vatican. Boston: Little, Brown and Company,	(1969). First edition. Stamp to half title else very good in slightly rubbed d/w. Ink On Paper 2 A Handbook of the Graphic Arts. New York: Harper & Row,	(1972). ARNOTT, James Fullerton and John William Robinson. English Theatrical Literature 1559-1900 A Bibliography incorporating Robert W. Lowe's A Bibliographical Account of English Theatrical Literature published in 1888. London: The Society for Theatre Research,	1970. First edition. 4to., cloth. FIne in d/w. Bibliography of the Writings of John Addington Symonds. New York: Burt Franklin,	(1968). Reprint. Fine without d/w as issued. Will H. Bradley: His Work A Bibliographical Guide. New Castle: Oak Knoll,	1995. First edition. (London: W.H. Smith,	1915). First edition. With a presentation inscription from the author dated "1925." Tall square 8vo., orig. cloth, (xviii), 414pp. Some minor rubbing o/w a fine copy. Montreal: Therien Freres Limited,	1940. Tall square 8vo., cont. dark blue three quarter morocco, marble boards, gilt lettering on the spine, 219, (4)pp. With the original wrappers bound in. Bookplate o/w near fine. A History of Wood-Engraving. With One Hundred and Twenty Illustrations. London: J.M. Dent & Company,	1928. First edition. 4to., orig. beige buckram, 263pp. Cloth slightly soiled o/w a nice copy. The English Novel 1740-1850 A Catalogue Including Prose Romances, Short Stories, And Translations Of Foreign Writers. Near fine in a nice d/w. BOOKSELLERS CATALOGUE) JAMES F. DRAKE. New York: James F. Drake,	1922-1924. Catalogues 150 through 163 bound in one volume. Sm.8vo., cont. blue morocco, cloth, raised bands, various pagination. Bookplate, scuff on cloth on upper board o/w a near fine copy. (BOOKSELLERS CATALOGUE). DAUBER & PINE BOOKSHOPS. Books on Natural History and Kindred Subjects. Cat. No. 40, 1929. BOUND WITH: No. 53: Natural History......1929-30, BOUND WITH: No. 73 Natural History.....1930-1031, BOUND WITH: NO. 96....1931-1932, BOUND WITH: No. 105 Natural History ....1932; BOUND WITH : No 110; BOUND WITH: No. 120 Natural History...1932-1933. Tall 8vo., eight catalogues (1929-1932) bound in one volume, modern cloth, various pagination. The Modern Library Colected By Viscount Esher at Watlington Park. NP: Privately Printed (in England at the Curwen Press),	1930. First edition. 1 of 100 copies. With a presentation inscription from Esher reading "Court Martin from Oliver, Oct. 1930." With a 1 page ALs from Esher to Martin laid in. In letter dated Dec. 17, 1930, Viscount Esher thanks Martin for the books he sent along and confirms that his copy of the 'catalogue' was sent ages ago. Signed "Oliver." 4to., orig. green buckram, xiv, 320pp. With markings in red pencil and ink, presumably by Martin, spine faded with wear to the spine ends but still a very good copy. In a homemade d/w. BROUGHTON, Leslie Nathan, Clark Sutherland Northup, Robert Brainard Pearsall. Robert Browing: A Bibliography 1830-1950. New York: Burt Franklin,	(1970). Reprint. Nelson Algren A Descriptive Bibliography. (Pittsburgh): University of Pittsburgh Press,	(1985). First edition. The Fortunes of Mitchell Kennerley, Bookman. New York: Harcourt Brace Jovanovich,	(1986). First edition. F. Scott Fitzgerald A Descriptive Bibliography. (Pittsburgh): University of Pittsburgh,	1972.